There's 11 comments so far. Last comment was posted 1 week, 5 days ago. « Come to Thursday Drink Night! 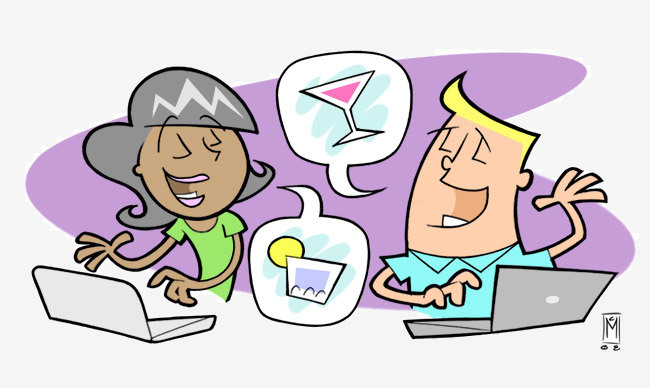 Over the course of the next eight or so hours, cocktail bloggers, readers, and mixologists of various sorts will be whipping up new potions in the Mixoloseum Chat Room (there are already a bunch of us in there). As we finalize brand new cocktails throughout the evening, I’ll be posting them here on Kaiser Penguin. Blair pretty much knocked us out of the water with this one. How did he even make this up? No one else had all of the ingredients, even with substitution. That said, it is a fine drink, surely. Blair is going to putting up a post about it soon, so look for it! Shake with crushed ice and donate to your favorite happy mug. Blair offered up a second tiki potion to pretty much secure our doom this evening (in a good way). It was crazy sweet before adding in the 1/2oz lime juice. Blair just posted this lovely beast. Created by Dan and Reed, faithful readers. Shake the hell out of it, and strain into a goblet glistening with crushed ice. Shake the jiggins out of it and strain into a shot glass. After we hit 20 cocktail fiends in the chat room, we needed something to bring us all back together. Michele provided the tool, and we all toasted to good friends and lots of pompous booze. Stir like a proper statesmen and strain into an upright cocktail glass. This was a blast! Looking forward to the next one, and already figuring out what ingredients I need to purchase to start catching up to the rest of you. And for the record, in case it gets lost in the fray, the ‘Revolutionary Cocktail’, which made it’s debut sometime before the Michelle put the (Lime) Hammer down. I was bummed I had to leave early, but glad I got to stay for a few drinks before disappearing for dinner. I was especially enamored of the Black River Sidecar. Spicy, tasty, richy goodness. Fun as all hell. I’ll keep tweaking that demerara cream thing and perhaps have it ready for next Thursday! And I couldn`t do more than add a cocktail early in the morning just before taking off..I`ll have to make yours in the weekend. I was surprised to see so many people still there 8 hours later after I signed out to go to sleep! I don`t know if I live on the right or wrong side of the pond..
Adam, I’m definitely getting the stuff to make the Revolutionary Cocktail. That looks delicious and nicely balanced. I really enjoyed adamatus’s recipe. Very tasty use of Aperol, and worked well with the Bluecoat.